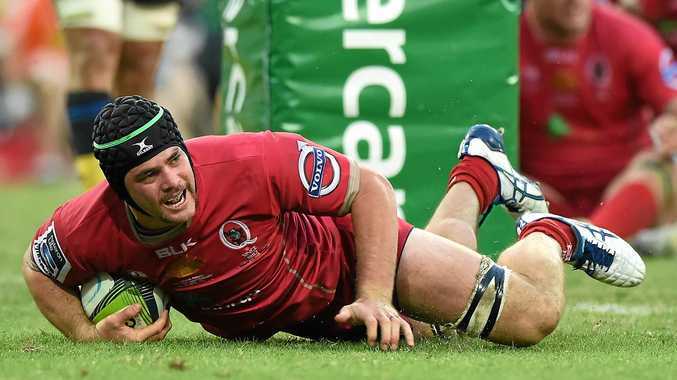 RUGBY: Reds flanker Liam Gill’s team was out of Super Rugby finals contention long ago. But he cannot contain his enthusiasm heading into Queensland’s final match of the year against the Rebels at Suncorp Stadium tonight. That is because the tireless back-rower will have the honour of captaining his beloved state before he leaves for France to play for Toulon, with regular leader James Slipper (sternum) sidelined. “It’s exciting. It’s something I haven’t really thought a whole deal about but it makes this last game a little more special,” Gill said. Despite both teams merely playing for pride tonight, the match will be an emotional one with Queensland stars Greg Holmes (Exeter), Saia Fainga’a (Brumbies), Ben Daley (Force) and Curtis Browning (Lyon) also to play elsewhere in 2017. “We understand that there are a lot of players we probably won’t ever see back at the club and for them to have their last games ... they’ve been stalwarts,” Gill said. As the Blues proved in Wednesday night’s dead-rubber State of Origin clash, often teams can play their best when there is nothing to lose. While the Reds were flogged 50-5 by the Chiefs last week, the Rebels were embarrassed 85-26 by the Crusaders, outlining the gulf between the New Zealand and Australian teams. “I think they (the Rebels) are happy to go along the same lines as us and ignore last week, and take this week for what it is,” Gill said. Meanwhile, the Waratahs have everything against them going into tonight’s must-win clash against the Blues at Eden Park in Auckland. The Blues have won the past nine out of 10 home games against the Tahs, with the last win for NSW over the Blues at “The Graveyard” back in 2009. Only the Australian conference winner – NSW or the Brumbies – will make the playoffs. The Tahs are going into the final round level on points with the Brumbies, who lead them on total wins and are expected to win comfortably against the Western Force in Canberra tomorrow night. “To go there with a mindset that we’re just going to play helter-skelter rugby would be foolish – our first priority is to win the game and then search for that bonus point,” Waratahs coach Daryl Gibson said.